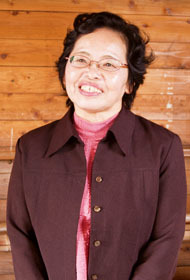 Tomoko Tazoe, living in Aso-gun, Kumamoto prefecture (59 years old) / She is taking Royal Jelly for 1 year and 2 months. When I was 40’s, I was diagnosed as Asthma. Now if I think about it, I have had asthma before long time ago. I often had persistent cough, especially while I was in a crowded place or the place in bad air since I was child. When I was feeling very bad, I experienced that my eye-sight got temporary blackout and that scared me. However, after I start taking Royal Jelly, my cough completely stoped so now I don’t need to use inhaler and medicines from the hospital. I was really stressed out because my cough made me insomnia sometimes, but now I can have a sound sleep every night. Due to my Asthma, my throat was very weak and I often got fever before I cure my asthma. But recently I think it’s completely gone. Now I’m very healthy and living with my sons with no problem. I would keep taking Royal Jelly from now on, and I will enjoy my life more than ever. Now if I think about my life so far, many people has helped me, especially when I was struggling with my health problems. If I would have a chance, I’d like to return for their kindness someday. After divorce, my life became very hard. I was working hard everyday and had a health problems such as hip joint problem, Carpal tunnel syndrome, Hernia and so on.